Folk fans are going to be flocking to the Bow Valley during the first weekend of August for the 42nd annual Canmore Folk Music Festival, taking place August 3 to 5 2019 in Canmore’s downtown Centennial Park. The longest-running folk festival in Alberta, the Canmore Folk Festival is renowned for its intimate atmosphere, superb music selection and unparalleled backdrop of majestic mountains. Featuring more than 50 craft, community and food vendor booths, three workshop stages, three evening concerts and a free children’s concert, the festival annually draws 3,000 to 5,000 fans daily. This year kids will be entertained with crafts, a climbing wall, clowns, jugglers, story tellers and much more. They are also two playgrounds located within the festival site. Throughout Sunday and Monday on the workshop stages, magic happens regularly when musicians from around the world meld their talents and create the kind of impromptu party music of which memories are made. This year’s line-up includes the fabulous Martin Sexton, Grammy award winner Mike Farris, the UK’s Oysterband, Juno award winner Amelia Curran, festival favorite Harry Manx, Latin American inspired John Reischman and Celso Machado, and remarkable blues & gospel artist Kat Danser to name but a few of the outstanding performers taking the stage over the weekend. For a full line-up, visit the festival website at www.canmorefolkfestival.com. The festival kicks off on the evening of Saturday August 1 where a host of musicians, including Kat Danser and bluegrass band Old Man Luedecke, will take to the main festival stage between 4.30pm and 11pm. Sunday August 2 sees daytime performances on 3 different stages from 10.30am to 4.20pm, with Blues, Soul, Celtic and Country being just a few of the genres represented. Sunday evening’s entertainment takes place from 4.30pm to 11pm on the main stage, with performances from artists such as the T. Buckley Trio, The Small Glories, and Martin Sexton. Monday’s schedule is similar with the daytime performances from 10.30am to 3.20pm on three stages and the evening concert from 3.30pm to 10pm on the main stage, where Coig, The Once, and Oysterband will perform, with Mike Farris bringing the festival to a close from 9pm to 10pm. In addition to the live music at the main festival site, there is a host of special festival events in Canmore, including a live broadcast of CKUA’s The Celtic Show with Andy Donnelly on Friday July 31 from 6-8pm at the Canmore Civic Centre. Other events include a free kids’ concert on August 1 from 1-2pm at the Canmore Senior Centre, a youth song writing workshop, free pancake breakfast on August 3, plus the Highline Magazine Pub Stage, yet another opportunity to see live music on Saturday, Sunday and Monday from 2.15-10.45pm (9.45pm finish on Monday) at Union Hall. Advance tickets are on sale online via TicketPro, or in person at Stonewaters in Canmore. Any remaining tickets will also be available at the gate Saturday, Sunday and Monday. For more information about the Canmore Folk Music Festival, including the latest event calendar visit www.canmorefolkfestival.com. Throughout the winter months Canmore Alberta is a fantastic base for skiing or snowboarding at some of Canada’s best ski areas. The world class ski resorts of Lake Louise, Sunshine Village and Mount Norquay are all an easy day trip from Canmore, and on a multi day visit you could quite easily ski or ride at all three of them! Blackstone Mountain Lodge features the Ski in the Canadian Rockies for Two package which includes luxury accommodations plus 2 adult one day ski passes which can be used to ski or ride at Sunshine Village, Lake Louise or Mount Norquay. Rates start at $235 per night for a minimum 2 night stay. See website for full details. Copperstone Resort Hotel is located only 30 mins from Nakiska Ski Area and to take advantage of the awesome skiing Nakiska is known for, Copperstone Resort is featuring a Nakiska Ski Package for Two which includes adult lift passes at Nakiska Ski Resort combined with lodging at Copperstone Resort Hotel. Rates start at $189 per night for a 2 night stay, and full information can be found by clicking here. Stoneridge Mountain Resort is not offering any ski or snowboard packages at this time, however they do have an early booking offer which can save you money off your Canmore accommodations throughout the 2018-2019 ski season. If you book 15 days prior to arrival you can save 25% off your room rate and if you book 45 days prior to arrival you can save 30%. Click here to take advantage of this deal. The Rocky Mountain Ski Lodge invites you to Build Your Own Ski Vacation which can save you up to 15% on your room rate when tri-area lift tickets and accommodation are purchased together directly with the hotel. Passes are valid for skiing or riding at Mount Norquay, Sunshine Village, or Lake Louise. Visit their website to find the full details of this deal. *The above rates are subject to tax and the packages may be subject to availability, subject to minimum room occupancy, subject to change, and blackout dates may apply. To confirm the details and to make a reservation, please contact each Canmore hotel directly. New Years in Canmore is a fun event for all ages, with both family friendly events and lively late night parties on offer. Of course many people coming to Canmore for 2018-19 New Years will want to ski or snowboard, and with Norquay, Sunshine Village, Lake Louise and Nakiska all within easy reach, there are plenty of options for hitting the slopes. Most hotels and accommodations in Canmore do not offer specific New Years packages as such, but you can bet that they are all open throughout the holiday period. New Years is a busy time in Canmore and you can expect hotel accommodation to fill up, so make sure you book your lodging as early as possible. *(note that, due to minimum stay requirements, checking a 2+ night stay will generally give you a larger number of hotels to choose from). Canmore’s community New Year’s Eve party takes place at the The 10th Street Pond, on December 31st 2018 from 6-10pm. These family friendly celebrations include DJ, bonfires, skating, and a live performance by popular country band The Reklaws. There will also be a variety of vendors featuring hot dogs, Swiss raclette, maple taffy and hot chocolate. Family fireworks will be at 8.30pm at the Pond and at midnight there will be another firework display at Millenium Park. The recently opened Malcolm Hotel will be hosting one of Canmore’s most formal New Year celebrations with cocktails and hors d’oeuvres from 7-8pm, gala buffet dinner from 8-9.30pm, live band & dancing from 10pm-1am including party favours and bubbly at midnight. The ‘black & white’ theme extends to the dress code, and tickets costing $199 per person can be purchased via their website or by phone. Stirling Grill is offering a New Years table d’hote from 5-9pm on Decebmber 31. The 5 course menu costs $95pp and features foie gras, duo of duck, chateau briand, and pumpkin harvest cheesecake, as well as other appetizing options. Tavern 1883 will be celebrating the last day of the year in a few different ways. In the early evening there will be a family buffet dinner from 5.30-7pm costing $20 for kids and $45 for adults. Later, from 7.30pm there will be a dinner & dance costing $70, or $50 for just the dinner. You can also choose to skip dinner and join the party after 9.30pm for $25. To celebrate the last day of 2018, the Drake will be hosting its own celebration with appetizers, party favours and live entertainment from Rockzilla. The event starts at 9pm and tickets, costing $60, are available by calling the Drake Inn. The Rose & Crown Pub will be hosting a party on New Year’s Eve, starting at 9pm. Entrance costs $15 and includes live DJs to keep the party rocking. It is recommended to get tickets in advance, which can be bought at the Rose & Crown or by phone. Table Food & Drink at Coast Canmore Hotel is offering a special 4 course NYE menu alongside its regular menu on December 31 2018. The feature menu costs $59pp and includes charcuterie, rabbit pistachio terrine, and seared venison loin. A live jazz trio will be playing from 6.30pm. Tapas is offering a “Best of Tapas” tasting menu for New Year’s Eve 2019, with the first seating from 5pm to 6pm and the second seating from 7.30pm, 8pm, 8.30pm or 9pm. For the first seating the regular a la carte menu will be available, and the second seatings will feature a $110pp special menu with delicacies such as cod croquettes, Iberico Belato + Serrano hams, gnocchi with lobster bisque sauce, and beef ribeye among other mouth watering dishes. For a small town, Canmore has more than its fair share of world class golf courses, with Silvertip Resort, Stewart Creek Golf Course and Canmore Golf & Curling Club each lying on the edge of town, and Kananaskis Country Golf Course (currently closed) just a half hour drive away. To help save you time and money, several Canmore hotels have put together special golf packages combining accommodation with Canadian Rockies golf at its best. To tee off, if you are looking for great value, the Rocky Mountain Ski Lodge offers affordable accommodations and is well located for all the golf courses in the Canmore area. Although the hotel does not offer specific golf deals, you could easily build yourself a package at a competitive rate by booking a stay here and organizing your tee times directly at the golf course of your choice. Falcon Crest Lodge offers a selection of beautiful rooms and one and two bedroom condo suites combined with discounted tee times at Stewart Creek Golf Course. Once you have a reservation, just give them a call to book your tee time. Located just 5 minutes outside of Canmore, Copperstone Resort Hotel can provide you with custom golf packages, which combines one of their suites with tee times at at one or more of the Bow Valley golf courses. Stoneridge Mountain Resort offer custom golf packages which can be tailored to your suit your own preferences. Simply choose how long you want to stay and where you would like to play golf, between Silvertip Resort, Stewart Creek Golf Course, or Canmore Golf & Curling Club. They will also organize a golf package for you playing at at the Fairmont Banff Springs golf course in Banff or Golden Golf Club. Also, guests at Stoneridge Mountain Resort can get preferred rates at Stewart Creek Golf Course by booking tee times through Stoneridge Guest Services. Blackstone Mountain Lodge also offers custom golf packages with 5 courses to choose from. And free golf club rentals at Stewart Creek can be arranged by booking a tee time directly with the hotel agent. The Holiday Inn Canmore is the closest Canmore hotel to the Silvertip golf course, and it’s no surprise that they offer golf packages which include accommodation plus tee times for 2 people at Silvertip. Rates for this package are dependent on the room type and your dates of travel and further details can be found by contacting the hotel. The above packages may be subject to availability, subject to applicable taxes and subject to change without notice. For full details and for reservations, please contact your Canmore accommodation directly. There are few better ways to start or end a day in the Canadian Rockies than taking a swim or going for a relaxing soak in a heated pool or jacuzzi. Fortunately there are several Canmore accommodations which feature indoor or outdoor swimming pools and hot tubs, including some with waterslides which are always a big hit with the kids. The following list of Canmore hotels with pools gives you a range of accommodation styles, each of which offers pool facilities where you will be able take that all important dip! Falcon Crest Lodge features deluxe rooms with kitchenettes or suites with full kitchens, where all guests can enjoy amazing views of the surrounding peaks from its two outdoor hot tubs. Blackstone Mountain Lodge offers luxurious accommodations in hotel rooms or one, two and three bedroom suites, and boasts a year round heated outdoor pool plus two outdoor hot tubs. Perfect for unwinding after a day in the mountains. Best Western Plus Pocaterra Inn has impressive pool facilities which families will enjoy, including a large indoor swimming pool with water slide (see above photo), hot tub, steam room, and sauna. Kids will love the playing on the 3 story waterslide at the Ramada Inn & Suites, while their parents can relax in the indoor pool or hot tub. Rocky Mountain Ski Lodge is an affordable Canmore hotel which features a jacuzzi tub with mountain views as well as a Nordic style sauna. At the Quality Resort Chateau Canmore there is an indoor heated swimming pool, outdoor hot tub, and a dry sauna for guests to enjoy. 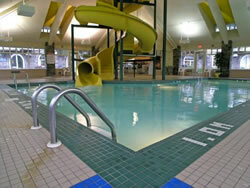 Guests at the Coast Canmore Hotel & Conference Centre can take advantage of an indoor swimming pool and hot tub. Stoneridge Mountain Resort offers luxury all suite lodging and boasts an outdoor heated swimming pool and outdoor hot tub in a picturesque courtyard area with lounge chairs. Guests at Grande Rockies Resort can relax in the heated indoor pool or hot tub, while the kids can play in the kids’ pool with a waterslide! After a day in the mountains, guests at the Holiday Inn Canmore can unwind in the outdoor whirlpool. Once in the shadow of the world famous town of Banff just 25km further west, Canmore has been transformed in recent years into a destination in its own right with an attractive downtown area, a fantastic selection of restaurants and cafes, and a wonderful variety of eclectic shops and art galleries. The town of Canmore also boasts an excellent network of local hiking and mountain biking trails, the fantastic Nordic Centre for cross country ski enthusiasts, and serves as the main gateway to the stunning Kananskis Country Provincial Park. Firstly, and perhaps most importantly, is the fact that hotels in Canmore tend to be cheaper than Banff hotels of the same standard. This is understandable – in Banff you are paying a premium for a location in a well established tourist destination within a National Park and UNESCO World Heritage Site. However, Banff National Park is just a 5 minute drive from most Canmore hotels, and it takes just 20 minutes to get to the town of Banff, meaning that a 40 minute round trip can allow you to enjoy all that Banff has to offer while still enabling you to save money on accommodation by staying in Canmore. This is especially true for a longer stay when the potential savings might add up quickly. Secondly, for anyone looking for a fully equipped suite or a condo with 2 or 3 bedrooms and a kitchen, rather than a standard hotel room, there is no doubt that Canmore has far more variety to offer in this area. Several of the newer properties in Canmore specialize in this type of accommodation and also offer many of the amenities that you might expect from a regular hotel such as a pool, hot tubs, and fitness facilities. This type of self contained accommodation also helps with the budget, as with your own cooking facilities you are not forced to eat out in a restaurant every day. Thirdly, the town of Canmore, despite having become more popular as a destination, is still much less busy than Banff. In the middle of summer it can be difficult to walk down the main street in Banff due to the crowds of tourists, while in contrast, downtown Canmore is much quieter and has retained that friendly local atmosphere that some visitors prefer. Lastly, for anyone visiting the Canadian Rockies from Calgary or Edmonton, Canmore is a shorter journey than Banff. Although it’s just a 15-20 minute difference, when leaving after work for a weekend in the mountains you might appreciate arriving at your hotel that little bit earlier, especially if you have dinner reservations or young children that need to get to bed. There is no doubt that Banff is and always will be a popular destination, and there many reasons that people would choose to stay there, however, as you’ve seen, it is also true that staying at a hotel in Canmore can be a great alternative even when your primary goal is to visit Banff and Banff National Park. With Thanksgiving just around the corner, it’s time to start planning your 2016 Thanksgiving weekend trip to Canmore and the Canadian Rockies. At this stage, a small number hotels in Canmore still have rooms available, but you’ll need to act fast to secure your accommodation, particularly for the night of Saturday October 8 which will most likely become fully booked. To check availability and rates at several Canmore hotels at one time, simply click here and enter your travel dates. The 2016 Thanksgiving holiday weekend is sure to be a busy one, and if you can’t find availability for a one night stay, you may have better luck with a 2 night stay, as some accommodations require a minimum stay on holiday weekends. With the wide selection of restaurants in Canmore, including restaurants at the hotels themselves, there will be several options for Thanksgiving dinner. Special Thanksgiving menus are usually advertised closer to the weekend. Thanksgiving weekend is a popular time to visit Canmore, and early reservations are recommended. To find the current availability and rates, and for reservations, please click here. The Artspeak Arts Festival in Canmore is an annual weekend event with cultural activities and performances presented by the Canadian Mountain Arts Foundation. The festival next takes place on September 25-27 2015 and most activities are free of charge. Visitors can expect to see visual arts, photographers, film makers, poets, authors, street performers, live music, an art fair, workshops and artist presentations. The festival calendar outlines the schedule which kicks off on the evening of Friday June 15 with the artScene ‘booze & schmooze’ night which gives Bow Valley artists the opportunity to network over a drink with live entertainment at Creekside Hall in the Canmore Senior Centre, costing $10. Saturday June 16 from 10am to 6pm there will be an opportunity to visit local artists in one of four themed tents celebrating Visual Artists, Media Artists, Literary Artists and Performing Artists. Also opening on Saturday is artWork 2012 Exhibit which will show collaborative work of local and visiting artists, working in different mediums. There will also be street performers providing a variety of entertainment throughout the Festival Grounds. From 2pm to 11pm the Festival Stage will host a range of performing artists which is likely to provide a fun party atmosphere into the night. On Sunday June 17 there will be professional development workshops and talks from visiting artists, and the festival will be brought to a close by artWord’s Literary Saloon, a celebration of Spoken Word from 7pm to 11pm at Canmore Miners Union Hall. The artSpeak Festival Grounds can be found between 8th and 9th Streets behind the library in downtown Canmore. The 16th Annual Canmore Rocky Mountain 10k & 5k Run/Walk is on September 11, 2011. Considered one of the most beautiful runs in Alberta, the CAUSE Canada Race is routed through woodlands, beside mountain streams, through a historic mine site and stunning views of mountain scenery. The track is a combination of asphalt and high quality gravel trail with several short climbs and winding paths. Recycling virtually everything, resulting in a waste-free Start/Finish zone. Exclusively using compostable cups sourced from renewable materials. Operating support-bicycles along the race course, as opposed to typical carbon generating support-vehicles. Administering a paper-free registration process. Serving only BC fruit & locally made baked goods. All proceeds from the race will go towards women’s literacy, numeracy, and business training in Central America and Western Africa. CAUSE Canada’s Women’s Integral Empowerment Program (WIEP) is being made possible by revenues generated through partnerships with athletes like you!